Wide range of options for customizing office themes and properly coordinating fonts, graphic formatting effects and colors all throughout your documents. If you are planning to become a certified professional when it comes to using Word 2010, then you should keep in mind that Brainmeasures, with the help of its high quality and comprehensive Word 2010 certification program, can offer you a lot of help. Brainmeasures has already proven to the public that all its programs along with their skill testing exams are highly effective and are sure to help improve the awareness of its participants regarding their chosen certification courses. The Word 2010 course which is now included among the many offers of the legitimate and ISO certified company is not an exception. With the highly accurate and updated learning materials used in the Word 2010 certification program offered by Brainmeasures, it will never be impossible for you to become more familiar about all the useful features installed in Word 2010 and how you can use all these in effectively organizing and writing your documents, easily accessing them and in dramatically boosting your productivity. As soon as you complete the Brainmeasures Word 2010 certification course, you will receive your certificate and start working as a renowned professional in the field. 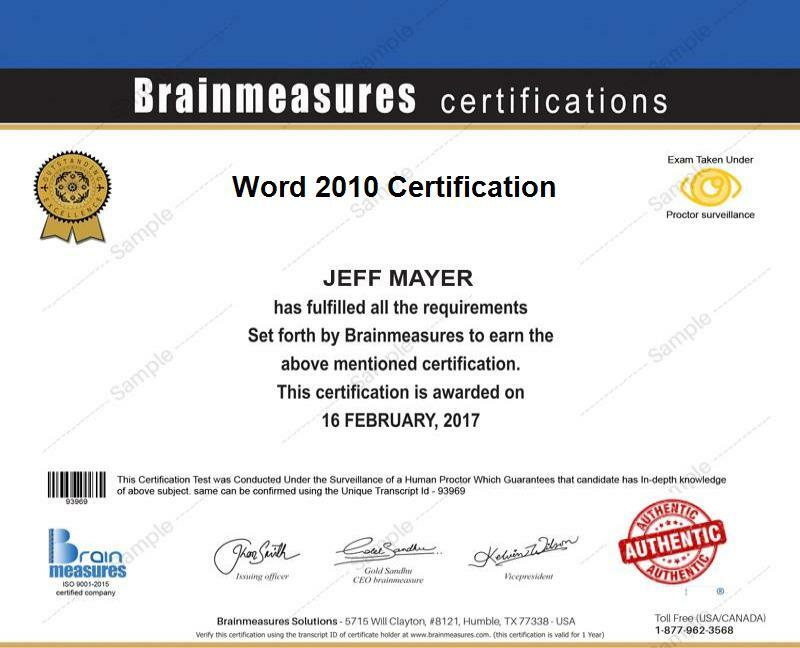 The Word 2010 certification program which is now available at Brainmeasures can help all individuals, whether students or professionals, in their attempt to produce the most impressive and professional-looking documents. It is perfect for anyone who wishes to understand the basic Word 2010 operations in order for them to have an easier time performing all their daily responsibilities. It is also perfect for you if you want to know more about all the Word 2010 features and techniques and how you can use all these in protecting all your documents and become even more productive. Being a Word 2010 certification holder also allows you to get positions in a business organization wherein you are allowed to obtain a higher level of income. If you get administrative positions, then you can expect to earn an average annual salary of $75,000. If you become a Word specialist after completing your Word 2010 certification, then you can expect to start receiving around $86,000. This can grow up to more than a hundred dollars as you gain more experience in the field and become more effective in your chosen career.